Thomas Austin Preston Jr., more commonly known as Amarillo Slim, was born on December 31, 1928 in Johnson, Arkansas. Amarillo Slim is one of the legends of poker, having traveled the country as a rounder with the likes of Doyle Brunson and Sailor Roberts. 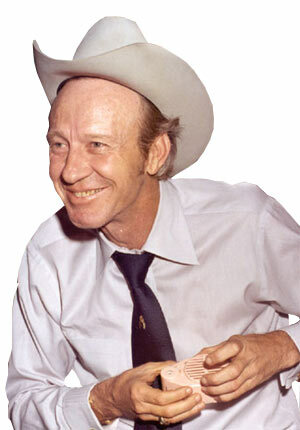 Amarillo Slim won the 1972 World Series of Poker Main Event. He made a final table deal with Doyle Brunson and Puggy Pearson to split the prize money, a deal that gave Amarillo Slim the title. After his WSOP victory, he appeared in several talk shows and has been involved in multiple movie endeavors, including an upcoming movie scheduled for release in 2009 entitled Amarillo Slim in which Nicolas Cage stars as Amarillo Slim. Amarillo Slim has won three more WSOP bracelets for a total of four, two of which came while playing Omaha Poker. Amarillo Slim is famous for his proposition bets, which have included playing one-pocket pool with Minnesota Fats while using a broom handle as well as using a carpenter’s hammer while playing golf with Evel Knievel. Amarillo Slim has had an interesting life, which has included being kidnapped by mistake while setting up a casino in Colombia. Some people have said that he threatened to slit his throat if a woman ever won the World Series of Poker, however what really happened in this case was that there was one very obnoxious woman at an early WSOP event who amassed a early chip lead and declared to the media that she would be the future champion. When she asked Amarillo Slim if he thought she could win, Amarillo Slim replied by saying that he would slit his throat if she won. Amarillo Slim has had some problems in recent years including being fired upon by a would-be robber on the street, being robbed in his own home, and one other case that has done severe damage to his reputation. In 2003, a grand jury indicted Amarillo Slim on three counts of indecency with his grand daughter. This event, coupled with Amarillo Slim’s losing interest in poker games at his age, has contributed to Amarillo Slim having almost completely withdrawn from the public’s eye. Thomas “Amarillo Slim” Preston Jr. died on April 29, 2012 at the age of 83.